Hand tooled, and painted, sterling silver berries, sterling and gold crosses with diamond adn turquoise inlay, alligator vamp, hand laced together. A work of wearable art! Hand tooled awesomeness brought to you again by Tres Outlaws. Arch angels with 18K gold and citranes. Beautiful denim blue sueded gator vamps, soft black suede tubes with denim blue sueded gator inlays, and best of all sterling silver Whoopie Girls inlayed with sterling silver stars inlayed on the denim blue sueded gator boot pulls. If you like girls or are a girl, you will like these! 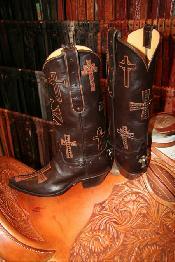 Hand tooled by Brad Martin with crosses from Silverking, Clint Orms and Doug Magnus. Two eagles and your own personal seal. Sterling silver embelishments by Sunset Trails on the heels and toe covers. Sterling silver berries and sterling silver stars. Hand tooled vamps; in the new tooling pattern. 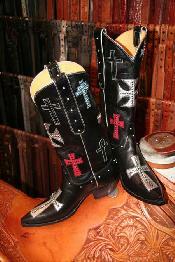 totally handmade by The Tres Outlaws Boot Company. Number four in an open series. 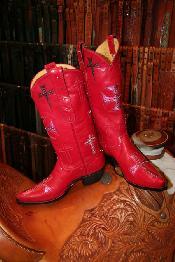 This pair features important tibutes to our governors' career. 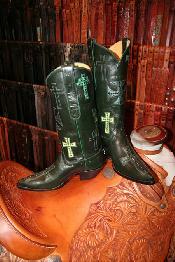 Handcut and handmade in El Paso by The Tres Outlaws Boot Company. 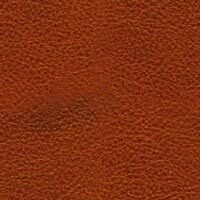 The vamp have a new exclusive tooling pattern. 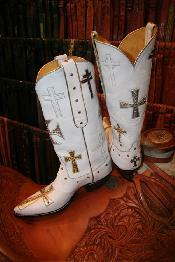 The latest example of sterling accents for your boots. This customer ordered an "Art of the Boot" selection for his own colection. 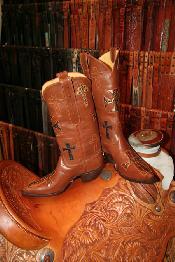 Totally handmade form The Tres Outlaws Boot Co., the sterling comes from the craftsman at Sunset Trails.